Does your business produce content? Want influencers to share your posts with their large audience? When you understand what motivates people to share, you’ll be more successful. In this article you’ll discover five tactics to encourage influencers to share your content. In a study of over 100 million articles, BuzzSumo found that the number of influencers who share a piece of content has a compounding effect on the total number of shares. On average, they discovered that a post shared by one influencer resulted in 31.8% more social shares. When three influencers shared a piece of content, it doubled the total number of shares; five influencers quadrupled it. 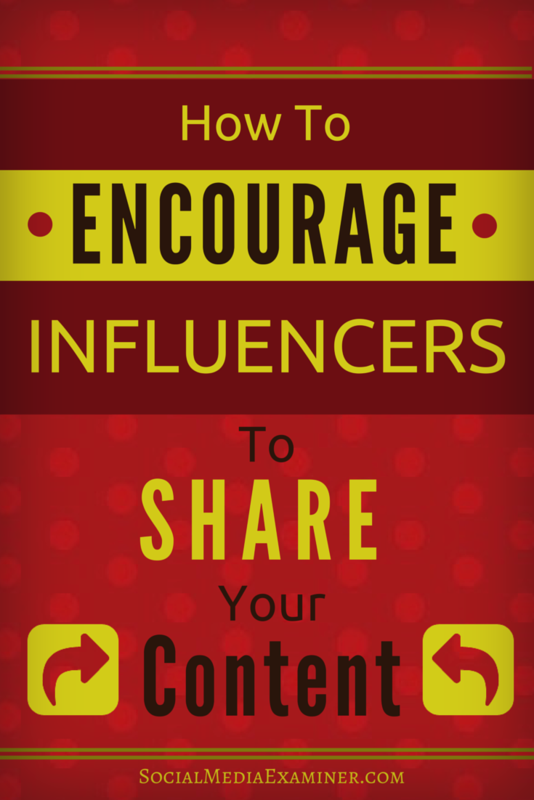 Discover how to encourage influencers to share your content. When influencers share your content, they help you reach a much larger audience with less promotional effort. Here’s how to get influencers to share your content. People are often motivated to share posts that say good things about them or highlight a positive trait. For a brand, this might be a best-of article that touts creating one of the best products in their industry. For a celebrity, it may be a post that shows he or she is using status to help a good cause. Create content that gives a highly regarded brand or someone influential (and deserving) free publicity and they and/or their marketing people will be sure to share. For example, Lagavulin was included as one of the top 10 scotch whiskies in this post. 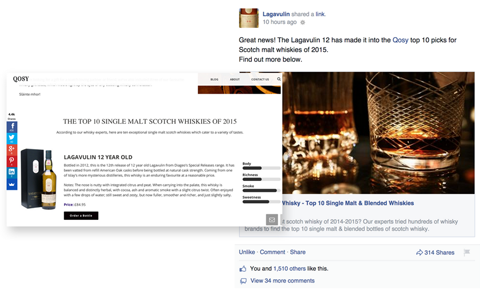 The post Lagavulin shared with the article generated more than 1,500 likes and 300 shares. Include influencer brands on a top 10 list, and they’re likely to share a post that gets great visibility and engagement. While many brands and influencers will pick up your mentions of their brand through social listening and brand monitoring tools, it usually helps to give them a little nudge. After you include influencers in a post, make sure they know about it. Message them through their website or social media site, such as Facebook or Google+. Also mention their Twitter handle in a tweet. A complimentary post from an unbiased source is likely to get shared. Create content that inspires brands and celebrities to do just that. Another way to get shared by influencers in your field is to research which sites they visit frequently. Then either guest post for one of the sites or pitch an article about your company to people who already write for it. It’s easy to discover which sites the social influencers in your industry use to find articles they share. Use a tool like Topsy or Followerwonk. Next, order Twitter profiles by social authority or influence. Then view the sites where these influencers share. A site like Followerwonk will help you find the Twitter profiles of influencers. You can then check out where these influencers find articles to share. As you scroll through the Twitter feed or timeline of an influencer in your industry, you’ll notice patterns of which sites they go to for finding good content to share. This kind of targeted outreach requires research and patience. However, if you appear on a site where your favorite influencer likes to share, you could benefit from all of that hard work. How many influencers did you ask to share your latest piece of published content? If the answer is zero or even just a few, you may want to get out of your comfort zone and start asking more people to share your work. Many people feel uncomfortable asking for favors, since they don’t want to inconvenience anyone. However, when someone asks for help, it can make both people feel good. 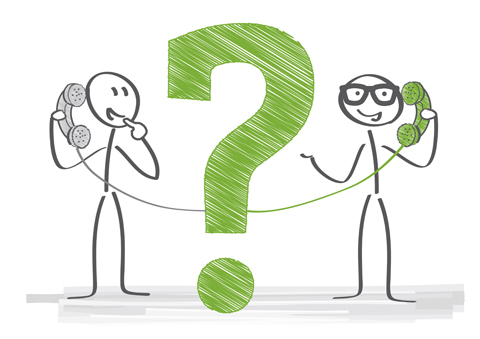 Asking influencers to share your content can be surprisingly effective. You just need to provide quality content that’s relevant to their audience. If you ask for a share, make sure your content is quality. Image: Shutterstock. Plus there is very little downside. It takes 5 to 10 minutes to send an email to the most influential person in your industry, and the potential benefits of him or her sharing your content is likely to be very worthwhile. Involve influencers in the creation of a piece of content, and they have a vested interest to help promote it. Do an interview with a targeted expert, request a guest post for your blog or get a quote for an article you’re already writing. Another tactic is to ask several influencers for a quote, recommendation or their opinion on a subject that relates to your industry. 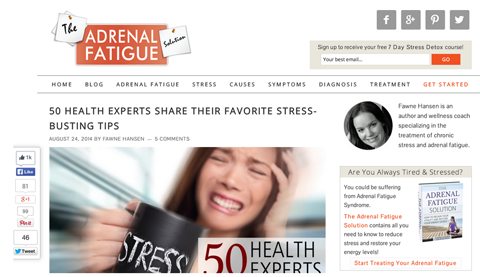 Then write a compilation article like this post, 50 Health Experts Share Their Favorite Stress Busting Tip. When you include insights from a lot of experts in your articles, you have that many more people likely to share it. Curating knowledge from a large number of people in your industry in an article is incredibly valuable for your readers. These articles also tend to generate a lot of social engagement, thanks to the initial surge of shares from the featured experts. When you involve influencers in creating a post, it’s almost guaranteed they’ll share it. Collecting quotes can be time-consuming, but the result is almost always worth the effort. Most influencers earn and retain their credibility by maintaining a very high standard of quality. If you want these people to share your content, create objectively exceptional content. 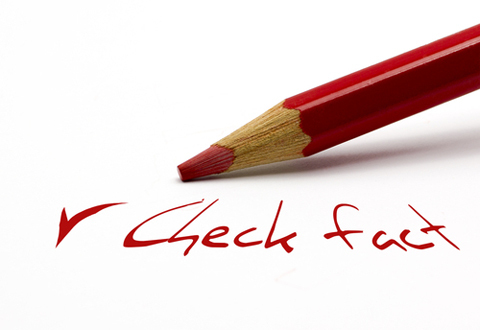 Take time to research, write, edit and fact-check articles. Shift your thinking away from quick fixes and ideas that have probably already been done. Instead, come up with unique concepts and strive for more ambitious projects. Do the work required to publish good, accurate content. Image: Shutterstock. More time invested in better content leads to greater opportunities for visibility and engagement. Influencers with millions of followers share content written by “regular people” all the time. So why shouldn’t they share yours? Take the necessary steps to create content they’ll share. When you understand what influences the influencers, it’s easy to create shareable content. Do the research, write interesting articles and follow up with the experts you include. Make sure they know they’ve been included and ask for them to share. If your words are relevant to your influencers’ audiences, it adds value and makes them look good. Before you know it, the influencers will look for your content, even when you aren’t writing about them. What do you think? What unique content are you working on right now? Have you gotten influencers to share your content? What tactics did you use? What recommendations do you have for others who want their posts noticed and shared by influencers? Please comment with your thoughts and recommendations. Consultant help photo and Red pencil photo from Shutterstock. 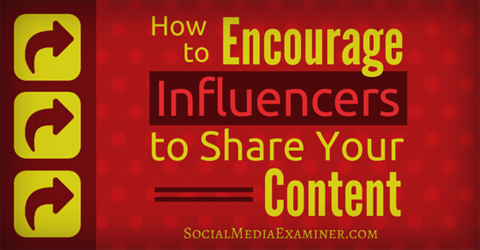 Tips for encouraging influencers to share your content. Marcus Taylor is the founder of Venture Harbour, a digital marketing studio that builds and grows a portfolio of online businesses including Qosy, MusicLawContracts.com, WhatisMyComfortZone.com and more.